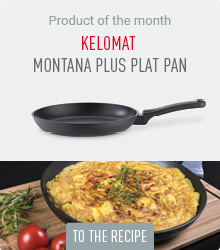 KELOMAT’s KERAMIKA pan with a 32-cm diameter is perfect for large quantaties and guarantees cooking without sticking, just like its smaller versions. The counter handle makes lifting the pan easier. Furthermore, the KERAMIKA pan is available in three other sizes: 20, 24, 28 cm diameter, and also as frying and oven pan in three sizes. Thanks to its ceramic coating, baked potatoes, steaks and sausages etc. will become crispy on the outside, without sticking to the pan. 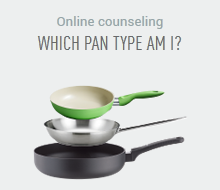 On the outside, the pan is made of premium stainless steel and on the inside, it has a dark grey ceramic non-stick sealing. The ceramic coating has a fantastic non-stick effect and enables easy handling thanks to its ergonomically shaped synthetic handle. The well-shaped pouring rim prevents the precious roasting juices from spilling. The ceramic sealing is robust. However, scratching and/or sharp objects should not be used on it. We recommend our synthetic kitchen aids.